Although you can use all premade and store purchased baked goods and cooked ingredients, I have used homemade fillings and homemade scratch brownies. For these recipes used in this recipe, click at the bottom for those links. Sprinkle the brownie layer with a few teaspoons of chocolate syrup, omit the coffee and alcohol. First get everything ready. Crumble up the brownies place in a bowl. In another bowl, mix the cheesecake filling, with your choice of coloring to make it pink or whatever color theme you want. Sprinkle Kahlua mixed with coffee on the brownie(or make the non alcohol version for kids) In the meantime, microwave some hot fudge topping for 30 seconds. Dip the strawberries in hot fudge and set aside. In a mason jar or other decorative glass, crumble brownies on the bottom in an even layer. Top with a few tablespoons or more to your liking of Kahlua/coffee mixture. Spread a few tablespoons of cheesecake filling over the top (Tip: for even easier method, put cheesecake filling in a ziplock bag and snip the corner off to fill, squeeze on top of brownies) then add the whipped cream. Repeat, brownie, Kahlua, cheesecake filling and whipped cream until you get to the top ending with whipped cream. Place a strawberry that has been dipped in warm chocolate hot fudge and add on the mound of whipped cream parfait. Sprinkle the top with any coordinating colored sugar this one is with red colored sugar... you can tint this any color you want for any Holiday or make a big batch using a very large one bowl glass trifle dish! Two fantastic desserts combined in one recipe...brilliant! This looks delicious. One of those desserts you want dive into and not stop until you have licked the bowl clean. Love these layers of flavors! Very creative, using the tiramisu filling. I am saving this one, it is definitely a winner, thanks so much for sharing this and have a great day! Love your new video features, Claudia!! Great dessert...so yummy and festive! You are a temptress.. the most satisfying fudgy, sweet winter dessert to soothe my snowy being. You are such a natural talent, on the video, Claudia! 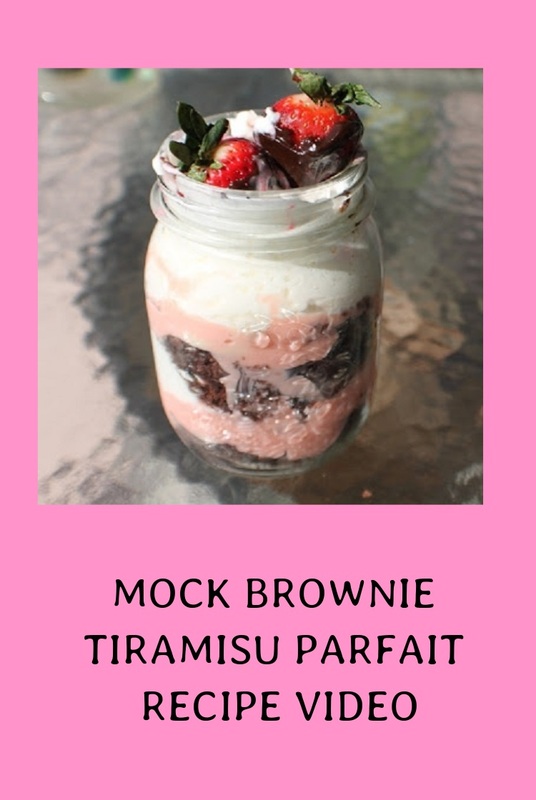 I would not call this droolworthy amazing dessert, "mock" anything! It's very REAL, love your cute Italian mason jar, and the Tiramisu filling, with the brownie, the Kahlua and all that whipped cream, the strawberries dipped in the chocolate fudge sauce...OK, enough, before I get in my car and drive to Orlando (3hrs drive) to have you make another batch...of course, I will bring the WW chocolate bundt cake! I love all your videos! And this tiramisu! Heavenly! Oh Claudia this is a fabulous dessert!!! My oldest turned 30 today and this dessert I know he would love. He's a huge brownie fan. The jars are an adorable idea too. Hope you had a wonderful day! Your dessert looks gorgeous and I bet it taste heavenly, too. Oh how I wish to have this as my midnight snack:)) Look so tasty! Great video Claudia..and beautiful photos! Congrats on making it to top 9!!! Claudia- Loved your video, well done. this is a great dessert to share, and the mason jars are perfect. The chocolate brownies, and the tiramisu filling, with Kahlua and more is over the top. Wow! Sounds and looks amazing. Congrats on Top 9! This dessert sounds amazing Claudia! Congrats on the Top 9! I love anything that comes with a fudgy brownie, and these look amazing!